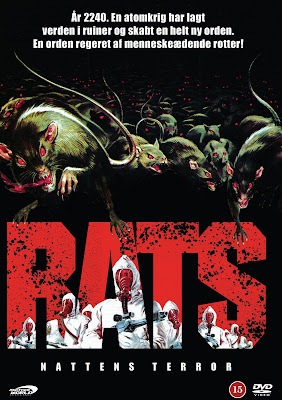 Last year the video company Another World Entertainment (AWE) asked me if I'd write a booklet for their then upcoming DVD release of Bruno Mattei's RATS: NIGHT OF TERROR (org. 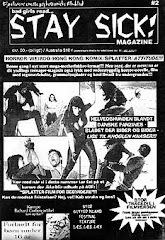 title: Rats: Notte di Terrore / Danish title: Rats: Nattens terror) and obviously I said yes. It was a fun experience to get published to a wider audience than the usual handful of readers in the underground (although nothing beats being an underground writer, of course). AWE don't pay their booklet writers a fee but let them pick a handful of DVDs from their catalogue + you get the DVD the booklet is written for. The DVD came out in March and all together it was a pretty exciting experience. The booklet is 4 pp. and has text on the centre pages. Obviously, I decided to write an introduction to "the booklet author". LOL. I mean why the hell not! 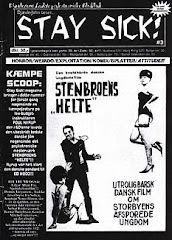 I remember in the very first issue I ever read of this world's (or any world's) coolest fanzine Oriental Cinema editor Damon Foster said: Don't just sit there and waste away! Try and promote yourself in whatever you do. Thanks, Damon. I've always remembered that (by the way, Foster now lives in Arizona where he makes a Satanic TV show about Devil worshipping and dangerous animals which Damon just thinks are cute! ), LOL. 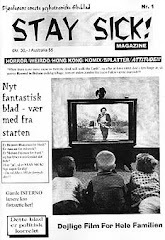 I learnt everything I know about fanzine writing from reading Oriental Cinema. No kidding! So far I'm the only AWE booklet author who has had an urge to tell the reader who he actually is. I must admit I don't quite understand the other writers and their being happy with this anonymity. Oh well. Their choice I guess, LOL. I'm saving this image for a future review.